The crushblat family is a family of frog-like creatures that attack Pikmin using their hard, crystal-like shells. Although the family was introduced in Hey! 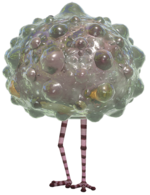 Pikmin, an assumed member of the family, the Calcified Crushblat, first appeared in Pikmin 3. The Calcified Crushblat is an enemy in Pikmin 3. It is a strange creature, apparently just a head with long, chicken-like legs. Its head is usually protected by a thick layer of calcification which can only be broken off by Rock Pikmin and bomb rocks. It is a rare creature, appearing only once in story mode, but appears quite more often in Mission Mode and Bingo Battle. It has the qualifications of a mini-boss, but is not considered as one, as the mini-boss music does not play when fighting it. The Crystaline Crusblat is an enemy in Hey! Pikmin. It is a cave-dwelling relative to the Calcified Crushblat. It is significantly smaller and weaker, but can be found quite commonly. Instead of having a brown face underneath its shell, it has a green one. "Crushblat" is the name that all members of the family have, along with a word before it. "Crush" is probably referring to the way members of the family crush Pikmin, while "blat" is not a word. This page was last edited on February 15, 2019, at 15:55.